The Dogs of the Dow had a rough first half of the year. The group has lagged the overall market through the majority of the year, but as it stands the group is managed to gain an average of 6.0% on the year, while the Dow Jones is currently up 4.5% year to date. 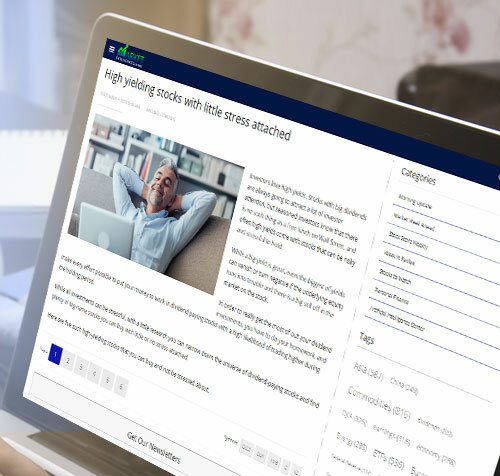 The idea behind the strategy is that you would purchase an equal dollar weighted amount of the ten stocks in the Dow Jones with the highest yields at the start of the year and hold them through the course of the year regardless of performance. The reasoning behind the strategy is that the stock’s yields have risen due to shares being undervalued and should rise more than the overall market in an up market or fall less than the overall market in a down market. With the stocks being the top yielding stocks in the Dow, you also get the benefit of periodic distributions, which can add a nice boost to the group’s overall performance. To better illustrate the power of the distributions, consider that while the group is currently up 6.0% on the year, if you were to strip out the dividends paid thus far in 2018, the gain would actually be 3.9%, which would lag the overall market. With the current earnings season all but in the books, now is a great time to take a look at this year’s group and see which stocks have been pulling the group down, and which have provided a the needed boost to push the group’s higher than the Dow. As was the case when we last checked in on the group, Merck (MRK) and Cisco Systems (CSCO) remain the top performers in the group. Both stocks are trading just shy of their 52-week high, with MRK up 27.0% and CSCO rising 26.2% on the year. Each stock has already reported earnings this quarter, and in both cases the numbers topped estimates on both the top and bottom line and pushed shares higher. The market is very bullish on both stocks, and both continue to trade with reasonable valuations. 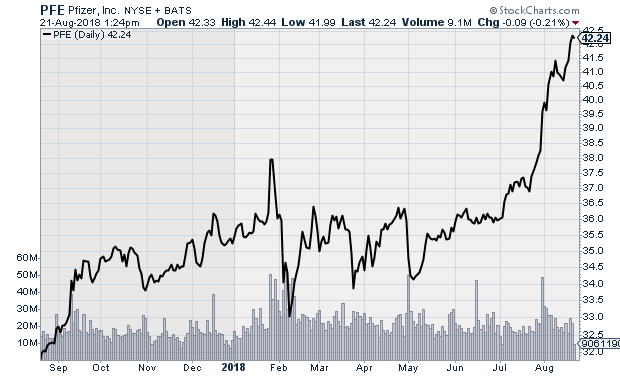 MRK has a forward P/E of 15, while CSCO’s forward P/E is at 14.2. Both valuations suggest shares could trend higher through the remainder of the summer. 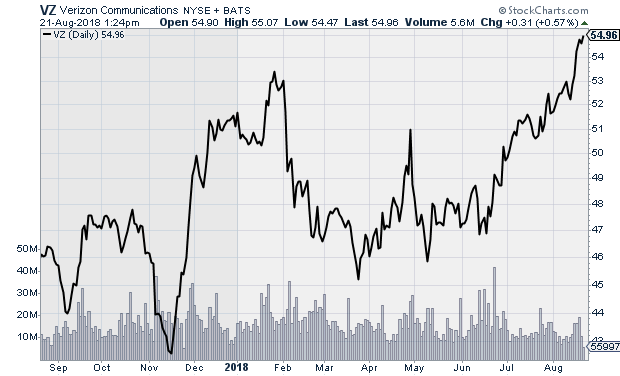 Verizon (VZ) has really helped push the group above the Dow over the last month. 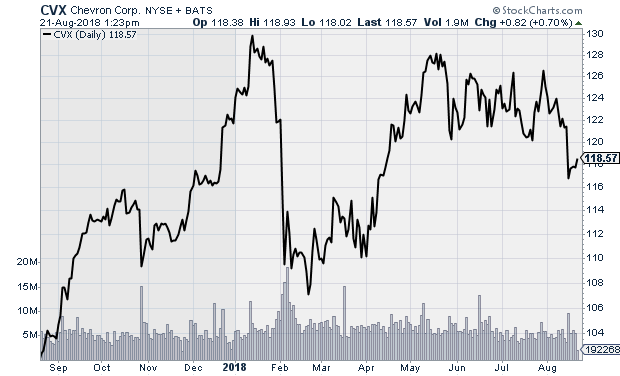 When we last looked at the group, VZ was pulling the overall group lower, with the position losing 5.2% year to date. The stock has rallied over the last month, and our position is now showing a nice gain of 10.4%, including three distributions made thus far. Verizon posted strong Q2 numbers in late July, topping estimates on both the top and bottom line, and driving the stock to a fresh 52-week high. Pfizer (PFE) is also in a strong upward trend, with the position currently up 21.3% on the year, versus a modest 1.6% gain when we most recently looked at the group at the end of June. Q2 numbers were strong, and the stock is currently trading just shy of its 52-week high following its quarterly report. VZ has a forward P/E of 11.5, and PFE has a forward P/E of 13.6, so neither is in any risk of significant profit taking following their recent bull runs. Both Coca-Cola (KO) and IBM (IBM) are showing modest gains on the year. Soft drink maker Coca-Cola has managed to rise slightly more than the overall market thanks to two dividends paid during the year. The position is sitting on a 4.8% gain, but the recent trend has been incredibly strong. 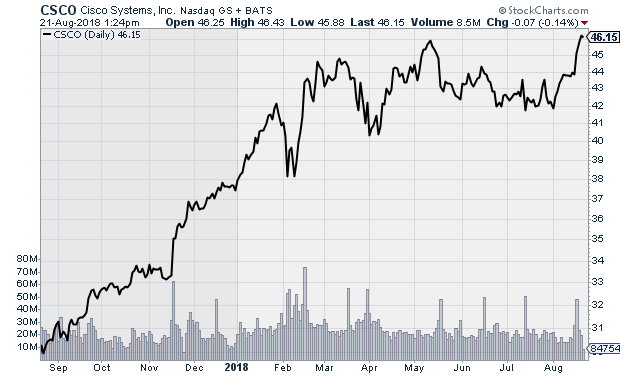 After hitting a 52-week low of $41.45 in mid-May, the stock has rallied and is currently trading at $46.56. A consumer shift away from sugary soft drinks continues to pose a problem for the company, but its most recent quarterly report in July showed better than expected earnings and sales. IBM has been struggling for years to find its way in a changing tech landscape. The company has put its focus on cloud and AI services, which so far have not been strong enough to outweigh its declining enterprise business. While the stock itself remains down 1.2% on the year, two dividend payments push the position into positive territory for the year, with a modest gain of 0.8%. 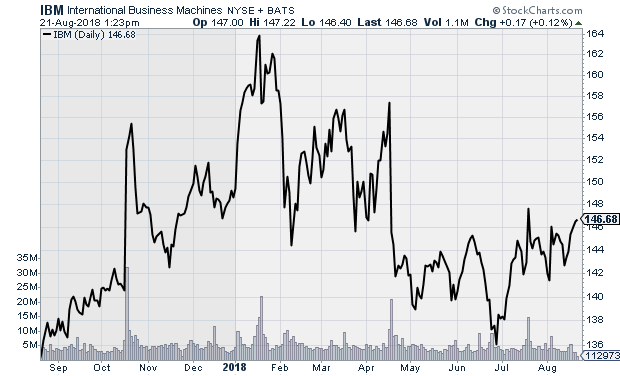 IBM continues to trade in the lower end of its 52-week range, and while its July earnings report did top estimates on both the top and bottom line, the company is going to have to start showing material improvements before Wall Street will turn bullish on the stock. 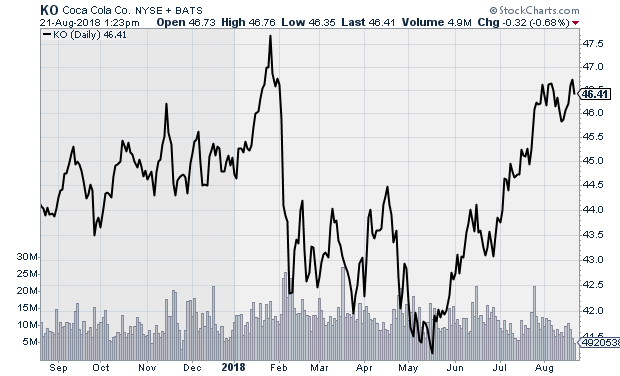 Our two oil and gas companies, Exxon Mobil (XOM) and Chevron (CVX) are both near break-even for the year, but both are currently in negative territory. 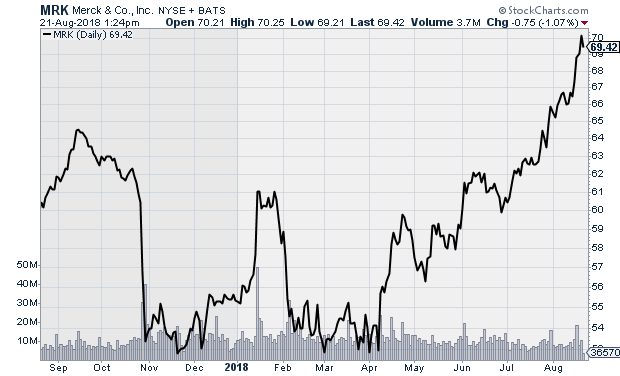 Accounting for two dividends each company has made during the year, XOM is down 0.1% and CVX is down 0.7%. Oil prices started to fall at the beginning of July, and both XOM and CVX have trended lower in sympathy. Fears over a possible trade war between the U.S. and China is weighing on the precious commodity, and the collapse of Turkey’s currency has spread into other emerging markets and hurt their currencies as well. This could have a meaningful impact on demand for not just oil, and all major commodities. The Federal Reserve is tightening its policy on the dollar, which is unlikely to change for the time being, and a stronger dollar makes oil more expensive which in turn would also have an impact on demand moving forward. Oil prices are down 10% from June, and with more downside possibly coming, XOM and CVX will likely struggle to remain in positive territory for the year, much less manage to outperform the Dow Jones in the final months of 2018. 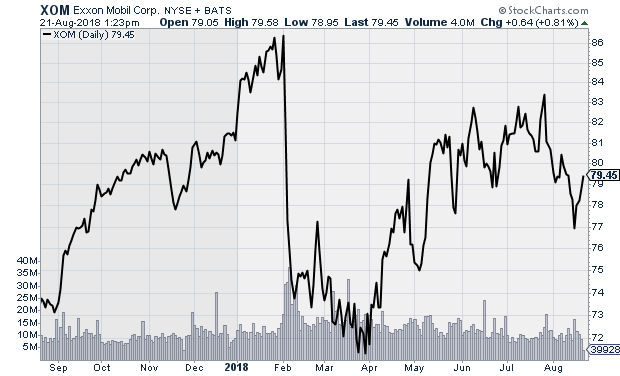 The two biggest drags on the group so far this year have been Procter & Gamble (PG) and General Electric (GE). 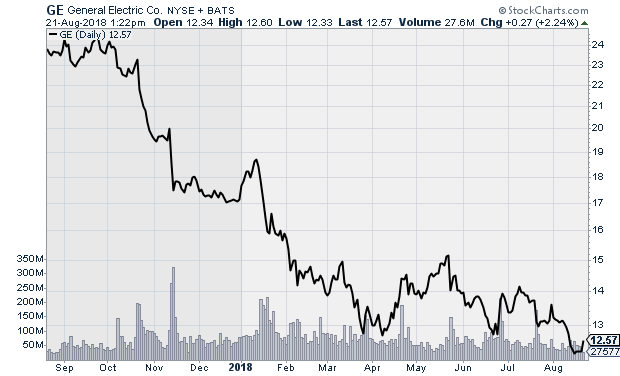 GE has had the worst of it, with the position down 25.5% on the year, while PG has enjoyed a nice run over the last three months, but remains down 4.7% since the start of the year. PG looks like it could continue to charge higher and possibly move into positive territory before year’s end. After hitting a 52-week low of $70.73 on May 2, the stock has rallied over 17% to $83.20 and remains in a strong upward trend. The company posted better than expected earnings for its most recent quarter, while sales were slightly weaker than expected. The market focused on the earnings beat, and shares should continue to move closer to break even through the remainder of the summer ahead of its next quarterly report in October. GE posted better than expected top and bottom line numbers in July, but the results were not enough to impress the market, and the stock remains near its 52-week low. 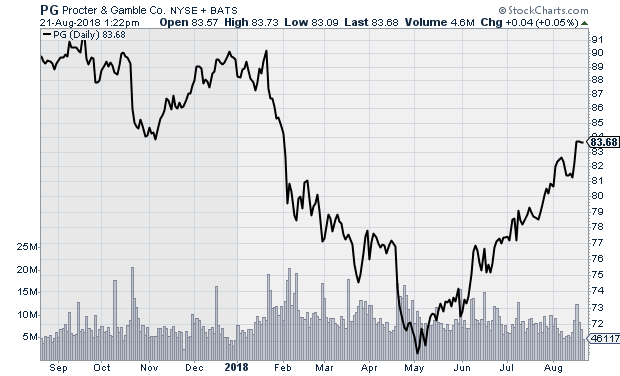 Sentiment is very bearish on the company, and the stock continues to look for a bottom.